I used to dream about becoming a writer, and at that time, I was thinking about writing books for young adults and children. Since I started making art, I’ve thought at times about maybe writing and illustrating my own books for children. I’m not sure that’s my calling, but a friend encouraged me months ago to give the illustrations a try by copying the work of an artist I admire. I inked this with the fine-nibbed 01 Micron pen. In hindsight, the next size up would have made the job quicker, and still would have given a fine enough line. Anyway, I have to say I am really happy with this drawing. I did this in bed (why do I do my best drawing in bed, between 10-11 at night? no clue) and it took me about a half hour, as I didn’t do it in pencil first, just went right in with ink. I think I’d like to draw more of the illustrations in this book, perhaps while listening to the audio! 😀 I’ve not read this since I was very young, so it’d be that much more fun. Are illustrations in my future? What do you think? To be fair, copying an illustration vs. coming up with something out of my own head (which I struggle with in drawing) are two very different things, but I’m happy with this attempt, anyway. It’s a start! Have a wonderful spring weekend. I wish you lots of time to create, read, relax, and just…be. We need more ‘be’ time, don’t you think? Peace. You never know until you try! Go for it! 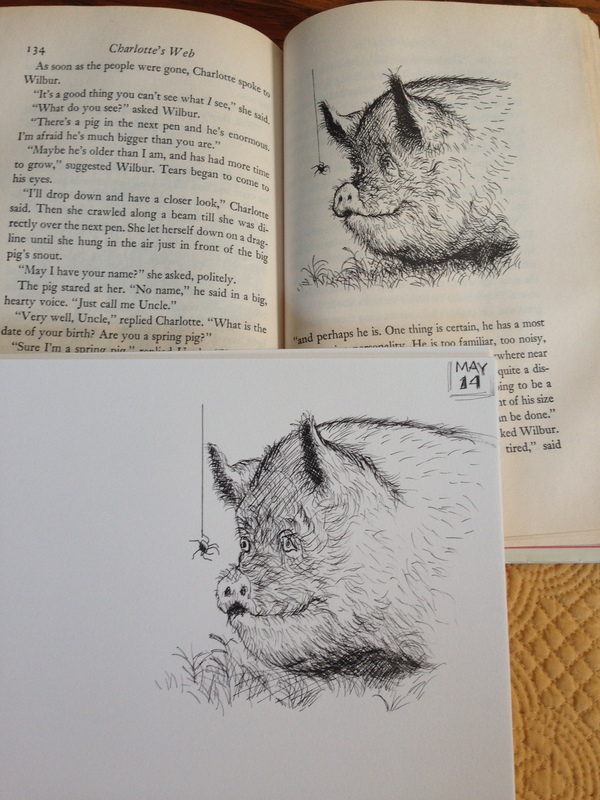 I LOVE LOVE LOVE “Charlotte’s Web” – the book that sparked my love for reading and writing. So glad you decided to draw sweet Wilbur. I actually re-read it several months ago and might have loved it even more! Great job on the proportions, especially considering you committed yourself in ink! Thanks, Rebecca! Drawing with ink is always a bit spooky, but it worked out with this one, I think. Maybe because it was so late at night. It puts in me in a “here goes nothing” mood, which usually helps in my artwork. I’m glad you liked it. Thanks, Teresa. I appreciate your advice. I definitely think you have the gift (including the one where you make up characters and illustrations, vs. copying someone else’s(!)). I’m just going to keep trying things until something really resonates. So far, the only thing that really sings loudly is portraits in colored pencil, but that’s not so much relaxation and fun like some of the other things I’ve tried. I love that book too. Tissues out every time. I think… You should also write something every day. Even if it’s just 5 or 10 minutes, just to build up that muscle, and set the groundwork for story inspiration. Write anything… lists, thoughts, freeflowing ideas, mini-stories, memories… Anything. I can totally picture you writing & illustrating books! Aww thanks Cat! I appreciate your encouragement. I’m so impressed that you did this going straight to ink~ very nice! I think that if you were meant to illustrate books you’d feel strongly pulled in that direction. I know what you mean, though. I feel sort of inclined to one thing or another with my art from time to time. Recently I sold a piece that was where my heart truly is, and the collector commented on how she could tell that I was “in” the painting. That told me that my heart has been trying to guide me in the studio all the time~ I just don’t always listen. Boy, I struggle with the shoulds all the time, Melissa! Wow. Some powerful advice there. Thank you very much. So interesting that your client saw you in that painting you felt so deeply. Very cool. Thanks again for your comment. Always appreciated. I love Charlotte’s Web. It’s such a heartwarming and hearbreaking book at the same time. Thank you so much, squirrelwriter! Thank you, Heather; Wilbur has a special place in my heart. My favorite book of all time. Sure wish you lived in LA. Would love to work with you on my children’s book as the illustrator. So kind of you to say that, Julie! I had no idea you were writing a children’s book! Wow, you’re a terrific writer; I’m so glad you’re doing this! Thank you so much, Evelyn. I don’t think it’s my dream job, but I used to dream of being a writer of young adult books….now I feel art is pulling me much harder….yet, to combine the two? Who knows. We’ll see how this plays out as I continue to experiment. Thanks so much for your thoughts; as you know, I really admire your work & talent. I love Charlotte’s Web was one of my favourites as well and now I want to re-read it. Might actually make it the next book I sit and read with my children. Wonderful picture and I think you should definitely give it a go. You never know what you might achieve if you don’t try. I hope to have a children’s book published one day, have some written and still working on some as well, that would be my dream and always has been :-). I’m so glad to hear of others with similar dreams; children really need books and pictures that speak to and inspire them. I wish you so much success! Thanks for your comment and encouragement, too. I agree, children do need books and not on kindles or similar either but proper books they can hold and turn the pages of. My children love books. They love reading, being read to and making up their own stories as well as adding their own pictures. I totally agree re: paper books. There is such a thing as too many electronics (IMO), particularly where our kids are concerned. Let’s just let them be kids. It’s sad to see a family when everyone is staring at their electronic devices. My kids have a restriction on screens. None during the working week they only have access at the weekends. Obviously we are often busy at the weekends so they don’t watch TV or play screen games for long at all. Thanks, CocoBee! I will check out that link. I appreciate it! This is really impressive. I’m amazed that you were able to capture it so accurately going straight to ink. As for copying versus coming up with illustrations yourself, there’s definitely a difference but it’s not as big as you might think. This is definitely still the first step. Even pros use reference pictures. They just add a touch of imagination to the copying ;). Sounds like fun. All of the times I’ve tried that it’s turned out horrible. Hopefully you have better luck than I did :). LOL, I’m envisioning similar results, trust me! hehe. Isn’t it amazing what we don’t even try because we just feel like we know we’ll fail? Very limiting. We must fling joy at those beliefs until they go away, lol. Lol, that’s a very good attitude. I should definitely practice failing more :P.
This is a really great drawing! Thank you so much! I’d like to do more, maybe from my imagination…..but I think to draw more actual animals before I could probably even attempt it. I have the same problem when I draw, I’m just not quite ready to not have a reference yet. Ok, here’s to smashing that barrier!! 🙂 Glad I’m not alone. This is fantastic! Yes, you should definitely consider illustrating children’s books! Illustrating children’s books is my life dream, so the last few years I have been researching, collecting books, and watching teaching series on illustrating. It is a whole other world (with a lot of work), but it is definitely worth the search. Whether you ever decide to illustrate or not, I don’t think you would regret the knowledge built. It is so fascinating! Thanks BB! Oh, you must!! You’re a wizard with those pens!! I love it!!!! I think you did an amazing job. lol, yeah, I don’t really have a choice at this point. I’m glad you like little Wilbur. Have you read the book, Ann? LOL 😄 You´re so funny! Thank you, Laura!!! By the way, that’s impressive!!! One of my fave books as a child 🙂 you’ve done a great job. Also, copying a book you admire is a wonderful way to explore children’s book illustration. I think you could do anything you were passionate about! Thank you! I’m searching, but I’ve always wanted to write a book for kids….never thought I could possibly illustrate one, too. But it a lot of fun, drawing this image. Looks good. You might as well start out emulating the best, and Garth Williams is one of them. Thank you! Any other illustrators come to mind? Maybe Winnie the Pooh would be a good one to try (I’ve never really thought beyond authors’ names; for all I know, Milne wrote and illustrated those books)? Yes I love Pooh too. Who was it wrote “Cherries and Cherry Pits”? I’ll have to look it up. Her work is colorful. I just packed up all the kids books I saved or I would look through. I’ll have to check that one out, I don’t think I’ve heard of it. Aww thanks for the link! This looks like a great series to check out! So cute! Brings back memories.